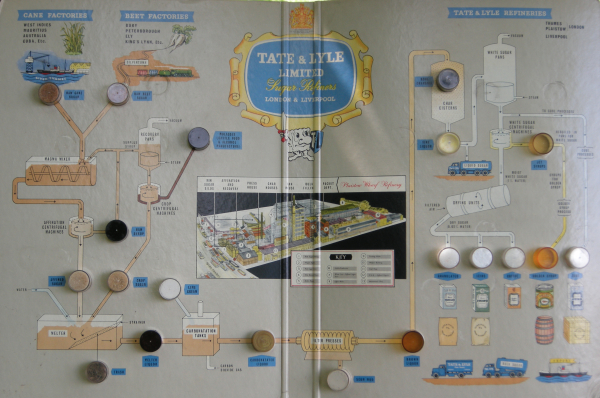 Tate & Lyle produced this wallchart for schools around this time. It shows the process from start to finish, including samples of each of the non-liquid process elements. Centrally is a plan of Plaistow Wharf. From Cane or Beet, delivered by water, road, or rail, Raw Sugar consists of impure Sucrose crystals with a film of Molasses. Mixed with Raw Syrup from a previous batch to soften the adhering molasses, the resulting Magma is spun in Centrifugal Machines to wash off as much molasses as possible. The sugar from 'affination' and 'recovery' is stirred and dissolved in hot water to the correct concentration, whilst strainers and brushes remove 'foreign objects'. ....which are then filtered off, the resulting Brown Liquor being sparkling bright and pale yellowish brown in colour. By running the brown liquor through filters of small granules of Bone Charcoal, it is decolourised and purified, leaving a water-white Fine Liquor. The fine liquor is now drawn into the Vacuum Pans for concentration and crystalisation. It is Evaporated under reduced pressure to form Sugar Crystals. The solution of mother syrup and crystals is then spun in Centrifugal Machines leaving the White Sugar Crystals which are then washed. The wet sugar is Dried in a current of hot air. After grading, the Dry Granulated Sugar is packeted for the domestic market, and bagged for the commercial market. For further details and contemporary photographs, see : "Sugar" by JAC Hugill, Cosmos Publications, London, 1949.